My co-worker, Joe Tower, is a designer/developer who is just getting into coding his own Drupal modules. Over at his blog, earlier this weekend, he created a basic module. I thought it needed a couple more things, so I'm gonna pick up where he left off. You might learn a bit or two about how the innards of Drupal work if you keep reading. I'm pretty sure that's not exactly what we want to do, though. This is where Drupal's built-in variable system is very helpful. Using the functions variable_set() and variable_get(), you can set/get small bits of data very easily. In this case, we're just setting "1" or "0", which is synonymous in this case to TRUE or FALSE. Therefore, this is the version of the above function where we get the content type name from the form id and then check a variable that is specific to that content type. Also, as you can see, I added a submit function that saves our custom variable. You'll also notice that the variable_get() function always expects a second variable which is the default value if this variable is not set. So, now you should have a much more functional module that has a checkbox on each content type's admin interface to decide if this will be defaulting to true on your site's content types. Update: My co-workers have created a Drupal module out of this idea. Check out the Default Menu Link module. It might just help you out. Over eight years ago, a young man named Donald Miller released a soon-to-be bestseller, Blue Like Jazz: Non-Religious Thoughts on Christian Spirituality. I read it a couple months ago, and I found it to be a non-conventional set of reflections on what God, Christianity, and religion is in this modern world. In the same way, I'm happy to say that the story and characters in Blue Like Jazz: The Movie will get you thinking about these ideas and discussing them with your friends. In the film, we find Donald Miller's character getting ready for college and finding himself disillusioned with the Texas Baptist church he grew up in. He decides to go to a whole different world -- a free-thinking institution in Portland, Oregon called Reed College. Despite meeting a whole bunch of new friends who dislike Christian culture and religion, he finds his beliefs and Christ's love still may have a place in his life. It's a good screenplay with plenty of drama, humor, and engaging discussions written by Donald Miller himself. The film adaptation of Blue Like Jazz is also well-directed and produced by filmmaker and former musician Steve Taylor and his Nashville-based crew. The film, although created by Christians, is far from what anyone considers a "Christian" film. The film premiered to agreeable audiences at SXSW a month ago, and contains almost nothing of what is often associated with Christian films. There is no scenes of preachers talking to the camera. Blue Like Jazz has no "conversion" experience or anyone praying over another person for them to be "saved". The acting is well-done and none of the sets look like they came from a soap opera. Instead, homosexuals are treated as just a character and not preached to. In addition to the rigorous academic atmosphere at Reed College, drug use, drinking and other activities on campus are portrayed as well. There are some scenes that poke fun at the insular Christian sub-culture, which may also disturb some believers who are proud of being apart from the rest of the world. The film is rated PG-13 and is distributed through Roadside Attractions, which also released Winter's Bone, Margin Call, and Biutiful. 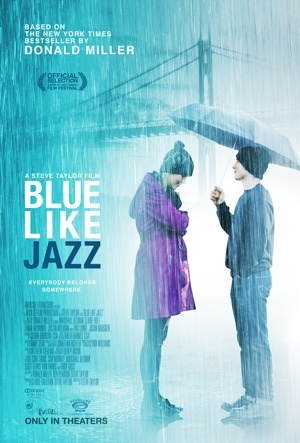 While Blue Like Jazz is not the best film I've seen in this past year, it is definitely worth a look. Also, as a Christian, I like to support films that portray Christianity in a genuine and realistic way. This film does this the best I've seen in a widely-released film created by Americans in years. I was fortunate to see an early screening a couple weeks ago, and after the film was shown, director Steve Taylor urged Christians to support the film. Roadside Attractions, a small independent distributor, has taken a risk on a type of independent film that often does not see the light of day. (In fact, the film was partially funded by fans on crowd funding website Kickstarter, of which I gave $50 to support the film.) Taylor stressed that if the film does well in the first 24-48 hours, it can give a message to Hollywood that there is a market for films made by Christians. So, by all means, if you're interested in supporting films made by Christians or are intrigued by the film, please visit a local theater playing Blue Like Jazz. Blue Like Jazz: The Movie opens in major markets this Friday, April 13. I, along with a couple friends, will be going out to screen the film at the Block e theater in downtown Minneapolis. Please watch the trailer and find a theater near you if you're interested in joining the discussion. If you do go and see Blue Like Jazz, please tell me what you think -- I'd love to hear your thoughts. How NBC and Warner Killed "Chuck"
A couple years ago, I watched the Pilot of "Chuck", a TV show where a common computer geek gets a supercomputer installed in his brain. It's got geek references, real spies, and lots of fun. It's equal parts drama, comedy, and action, sometimes even a couple of those in the same scene. I haven't seen a tone of television in my years, but it's easily my favorite show currently on television. But that won't last for long, because the show's finale is just over a week away. The finale is not coming as a surprise; the end of every season always contained the question of whether it would be renewed and this current season being the last season was announced over 6 months ago. However, this fifth and final season, while it's been lots of fun and looks like it will come to a great ending, has been less than impressive with viewership. In my opinion, it's clear that NBC and Warner Bros. (who produces/owns the show) did as much as they could to intentionally kill Chuck once and for all. First, the show was moved from Mondays to Fridays on the weekly lineup. Friday, along with Saturday, are the weakest nights in TV viewing, excepting maybe sporting events. Geek TV fans know that shows like Dollhouse, Firefly, and Battlestar Galactica have aired on Fridays and never did amazing in the ratings. It's just a fact that many folks go out on Friday and Saturday instead of staying home and watching TV. If I didn't have a DVR, I would've missed probably half of the episodes so far this season. Mondays worked much better for most viewers, I'm sure, because all folks want to do after a "case of the Mondays" at work is to sit at home, eat a pizza, and watch Chuck and then Castle. Second, for the first four seasons of Chuck, there was plenty of content available online. Throughout the first four seasons, the show was available to stream on Hulu the next day, just like other NBC programs. Intermittently, the show was also available for purchase on iTunes and Amazon VOD as well. However, for unknown reasons, season five has not been available on Hulu or any other video providers online. This, combined with the Friday problem, means that anyone who misses an episode may just wait until the end of the season to rent it on DVD. Either that or the fan without a DVR is forced to pirate the show, such that this viewing is not counted in ratings nor any revenue is gained by the show. It seems that the folks at NBC/WB didn't want the fans to come back if they missed an episode because they gave them little choices. This is not what a show like this should do. Look at shows like Lost and Battlestar Galactica: they made it easy for folks to catch up with episodes they missed online and even did promotional materials to get fans caught up with the major plot points quickly if they didn't have the time to watch all the episodes. These are things that NBC/WB should be doing to keep the casual Chuck fans watching if they wanted to coax decent ratings out of the end of the show. Third, a planned ending to a show should be an opportunity for the networks/producers to experiment and possibly gain new viewers. Many folks got into Lost just before the last season because the entire show was available for streaming on Hulu, Netflix, and other outlets. In fact, after hearing about Chuck and deciding to give it a chance two years ago, I found the pilot available on Hulu and then watched the next six episodes on WB.com. If I hadn't gotten the opportunity to watch those early episodes right away, I might not have gotten hooked. After watching those online episodes, I used my Netflix subscription to rent all the later episodes of Chuck to get up to what was currently available. What Warner Bros. and NBC should have done was put all four seasons on Netflix streaming this past summer. I have no doubt that there would be thousands of viewers that would watch all four seasons and would now be watching NBC every Friday, had NBC given them a chance. Just a couple months ago, CBS's hit sitcom "How I Met Your Mother" was put up on Netflix and there's been a small bump in ratings since then. Also, all my friends who watch most of their TV on Hulu and Netflix are watching "How I Met Your Mother" and talking about it for the first time despite the show having been on for seven seasons. In the end, it seems that the folks at WB refuse to do these internet streaming things because they fear it will eat into their DVD/Blu-Ray sales. However, I don't believe it. I may not be the average customer, but I didn't buy the Blu-Rays of every season of Chuck until I had watched every episode available. If I cannot rent the disc or view the main feature content online, I will not purchase the product unless it is ridiculously cheap. For me, I see Chuck as something I may want to re-watch in a couple years or share with friends (and I have already), and that's why I want the Blu-Ray. But I would have never bought the discs if I had to search the show's back episodes out illegally. The show needs to be accessible in order to increase viewership and sales, and especially in the last six months, this seems to be the farthest from NBC and Warner's minds. If these ideas were better executed, the show would not be the only thing going out on a graceful note; the folks who own the content would be happy with a sound investment not squandered. In these trying times for America, they need a charismatic President that knows what's going on. 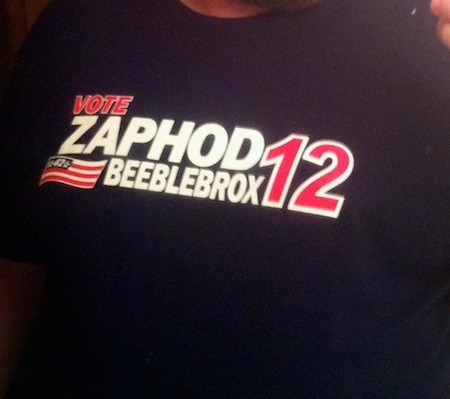 Zaphod Beeblebrox, a two-headed humanoid from the vicinity of Betelgeuse, is probably not that man. But he has been the President of the Galaxy. But, oh wait, in that version of history, the Earth has been destroyed to make room for a hyperspace bypass. This morning, Netflix CEO Reed Hastings took what may possibly be the biggest gamble of his life. Netflix has been a successful company for over a decade, starting as a DVD-rental-by-mail service since 1998. Ten years later, they started offering streaming of movies and TV shows over the Internet, no longer requiring the DVD-by-mail. In the last six months or so, some Internet statistics companies (which are a bit spurious) claimed that as much as 40% of prime-time Internet traffic was Netflix Instant traffic. Netflix was a force to be reckoned with, but the last couple months, they've been struggling with that status and may be losing their footing. Recently, many casual Netflix customers have been threatening to cancel their service due to Netflix's termination of their contract with Starz. Starz was providing access to a limited amount of new-release movies on Instant, but it was a drop in the bucket of the streaming content. But those of us who like quality in movie presentation were nonplussed with the Starz contract, as most of the content was not in HD and sometimes in a full-screen presentation instead of the original widescreen. Personally, I believe the cancellation of the Starz Play deal was a great move for Netflix because it allowed Netflix to spend that money to make deals directly with the studios. The next big move was Netflix's announcement a couple months ago that September would bring two different feature sets to the service. Streaming, which started as a free bonus for DVD customers just over 3 years ago, was now to cost $7.99. If you wanted to keep the DVD service as well, that was an additional $7.99. From a business point of view, I think this made sense to some extent. As Hastings says, each of these products has their own business model and set of costs. But, while I was happy to pay $7.99 in August, I'm not happy to pay $15.98 in September. The Instant service has drastically increased in value to me with the inclusion of many more great TV shows and some movies, but to suddenly pay twice as much for Netflix service is a hard pill to swallow. And while there are days and days of content I want to watch on Instant, there's no way to watch that movie that I just recently missed while it was in theaters if I cancel the DVD-by-mail service. Long-time Netflix customers either have to choose to pay the big bucks or cancel one half of their services. This would have been easily mitigated by offering a discount of $3 or so when both services were included. And, honestly, when I got an e-mail from Netflix (which is much like this post from their official blog) this morning apologizing, I was expecting that kind of discount. But what we got was much more confusing. Netflix CEO Reed Hastings apologized not for the price hikes, but he apologized for not really telling us why the price hikes were happening. Funnily enough, that was not something I thought he needed to apologize for. I already explained why the pricing was separated; the services are really two separate products and should be treated as such. I was on board with that. In fact, just a few days ago I canceled the streaming service because I was worried I'd spend all winder watching every episode of Star Trek and getting nothing productive done while online. No, the real reason the price hikes were apparently happening was much more puzzling. As Hastings mentions in his blog post, he firmly believes that streaming movies and TV shows to your home via the Internet is the future. I believe he's right. Once the Internet is fast enough to deliver high-quality content to the masses on a just-in-time basis, the movie disc will disappear. (While the technology to deliver content this fast exists, it seems that most of the developed world is still years away from achieving this.) Also, as Hastings says, for five years, he has feared that he'd miss that point. He doesn't want Netflix to become the next AOL or Borders, where the business model died and they went down with it. For years I've heard him talk about this and thought he was on the right track, but today it has become apparent that Hastings is no longer healthily fearful of the future, he's foolishly obsessed with it. The fact is, Hastings's Netflix is far from missing the trend. In reality, Netflix has done most of the work to make the trend happen. Before Netflix Instant appeared, almost no one was streaming movies online. YouTube had only been around for a couple years. Heck, Hulu had just started a year before. Netflix brought streaming video from a thing the computer nerds might do to millions of American households in the span of a couple years. Their streaming service is still built into thousands of different TVs, Blu-Ray players, and Internet-connected boxes and phones besides your computer, more than any other competitor. Without Netflix, Blockbuster would still be going strong and we'd still be going there every week to get the next disc of 30 Rock for a week. There would maybe not even be a streaming video market. This morning, Hastings announced that the reason the pricing was changing was because the Netflix DVD service was being spun off into a subsidiary called Qwikster. Apparently it wasn't enough to have two separate products, but each product had to be under it's own brand and company in the name of bringing "simplicity for our members". (Speaking of which, I think many companies would like to have just two products -- many companies Netflix's size have hundreds of products.) For gamers, there was the addition of disc-by-mail game rentals via the new Qwikster product announced, so at least some customers may find a silver lining. But for the majority of Netflix users, it seems like the only result is more confusion and pain. Netflix and Qwikster, for those who really enjoy movies, are not two separate products, they are two parts of the same whole. If I find a movie I want to watch, I add it to my Netflix Queue. It's my "what I want to watch" list. It's been great that Netflix says, for now, "Instead of waiting for you to get to this in your queue, you could watch it right now via Instant." But, as described now, a subscriber to both Netflix and Qwikster would have two separate queues with no interaction. If Qwikster offers a similar developer API to what Netflix offers, I"m sure someone will write an app to sync the queues, but it will inherently not work as well as a first-party solution. Two separate services do not provide as comprehensive a solution for their most devoted customer, I believe. One unified company also seemed to be a good place to negotiate with studios. A streaming-only Netflix service is entirely dependent on the whims of the major studios. If the major studios pulled all their content off of streaming, Netflix wouldn't have much content to speak of. Netflix does give the studios substantial money for the rights to stream their content, but it's not as substantial per viewer as the studios selling it on iTunes or Amazon or via DVD or Blu-Ray. It's much less. Many content properties are worth more than the earnings the studios get from Netflix, and if they want to make more per viewer, they can cut Netflix off. In short, if the studios want to shut Netflix Instant down, they definitely can now because Qwikster is no longer a built-in bargaining chip. That doesn't seem like a better spot to be in to me. In the long term, I think it makes sense to relegate Qwikster to a separate service, company and brand. Qwikster may thrive for a number of years, but it is a dog that has seen its day and will not grow. Netflix is where the exciting stuff is. But I think that Reed Hastings has, overcome with fear, split them off a couple years too soon. Even he admits in the blog: "It is possible we are moving too fast – it is hard to say." He's right, it is hard to say. I think the next few years will be tough for Netflix and its subsidiaries to regain the momentum that it has lost in the last couple months, but they may be able to keep the car running. Or, we may be witnessing Netflix flying through the air, about to crash into a concrete wall. Only time will tell. Starting with the iPhone and it's brethren the iPod touch and the iPad, Apple only allows you to download and purchase apps via their App Store, which requires approval from Apple to sell them. In the last year, Apple has also made it an option to buy apps for Mac OS X through their sanctioned App Store as well. This has some inherent benefits, most notably a level of security and a trust party to collect payment as well as an easy way to get updates to apps. But, in the end, there's still many shortcomings in the App Store model. For example, take my recent purchase, the Reeder app. Over the last couple years, I'd tried out a couple apps, such as NetNewsWire, which used the Google Reader API to provide an app interface to reading your Google Reader subscriptions. (I've been a longtime Google Reader user and have been happy using the great web interface for reading RSS subscriptions both at home and one the go.) NetNewsWire, being free, seemed pretty full-featured, but there were a couple things that it didn't do, like not giving a way to mark an item as Unread in case I started reading and found I couldn't read it right now. Reeder's short list of features on the App Store on their website included that feature, so I was intrigued. With the App Store, there's no way to try out the app. For the iPhone, the app is $2.99. Reeder for Mac has been heavily featured in related areas of the Mac App Store, which usually means it's a quality (or at least popular) product, but the desktop app is $9.99. In the era before the App Store, if this app existed, it would probably have a free trial for a week or two. Then, you'd have to purchase a license key from a sketchy website and hope that it worked to validate the product. If there was a free trial, I would have found that besides the good looks that show up in the screenshots, there's also a plethora of customization options to customize the reading experience. You can customize the main text size, update the color scheme, and share posts with almost every service imaginable from Evernote to Delicious to Instapaper (and more). The iPhone app also seems to sync all your items to a local cache (including images), so that you can read your posts when you've got no internet connection. The features are all I wanted and the price isn't bad. How did I find all this out without a free trial? I looked at the Reeder app a couple times over the last month or two but I didn't buy it. It was only this past week when tech podcaster Tom Merritt listed it as a "pick" when guest hosting on This Week in Google that I decided to take the $2.99 jump for the iPhone app. If it wasn't good enough, I was going to be out $3, but I figured it was a decent gamble. After 15 minutes of using the iPhone app and browsing through the extensive Preference panel for the app, I immediately purchased the Reeder for Mac app because I figured if the iPhone app was this good, it'd make my on-computer reading experience much better, which was definitely true. Still, to make the App Store really beneficial, I think there should be a couple things to be done. First, Apple should give developers a way to allow users to try the app for free, if the developer chooses to do so. This would cut down on the number of negative reviews for an app because users didn't do their research and thought the app did something completely different than it actually does. Second, every app should have an extensive website that documents every feature of the app. Some videos of the app in action could be helpful too. A half-dozen screenshots and a dozen bullets in a "features" list don't give us an idea of what an app really does. In the end, the Apple Mac/iOS App Store is a benefit to most users. But in streamlining the purchasing experience for the mainstream it has lost much of the details that more discerning buyers have expected and required for years. Yes, the iPad 2 is not for me. The iPad may be the future of mainstream computing, but at this time, it's not for me. More on that in a minute, though. First, here's the skinny on the new iPad 2, announced by Apple yesterday in San Francisco by Steve Jobs and his snappy presentation crew. The iPad 2 is the same price but definitely packs some new features. The amount of storage space is the same as the previous iPad but it is 33% thinner, has both a front and rear camera, and still has 10 hours of battery life. Apple claims the hardware of the iPad 2 is an "all-new design", but that seems to be complete hyperbole -- the design is improved a lot over the original iPad, but it still looks much like the same device. Never content to keep it just as fast as the last model, Apple is also introducing an A5 mobile chipset with the iPad 2 that they claim is twice as fast as the previous A4 chip and boasts that graphics rendering performance is 9x faster. Early reports from journalists say that it is noticeably snappier. It's clear that the iPad is taking off more than anyone, including Apple, expected it to. Apple announced that in the 9 months it was available during 2010, it sold 15 million units. That's nearly twice what the most bullish predictions were just one year ago before the original iPad came out. And there's no wonder: it takes the ability to use a computer and makes it dead simple. There's no figuring out how to use a touchpad or a mouse. There's no "What folder did I put that file in?" moments. It's just simple to browse the web, play a game or watch a video. In the 11 months it's been available, it's been adopted in record numbers by younger kids and senior citizens who have never touched a computer before and they "get it" a lot easier than older technologies. Most likely, computers of the future are going to be something like the iPad. But, at this time, the iPad is not for me. I'm not down on Apple; I have two Macs, an iPod, and an AirPort Express. My iPhone 4 is rarely more than a couple feet from me; I think it's the perfect size for watching videos and browsing Twitter and the web on the go. One of my Macs is a MacBook Pro. Yes, it's a bit bigger than the iPad 2. It's also a bit more expensive. But it allows me to do much more. My livelihood is programming websites and the built-in keyboard helps out with that. I can install thousands more apps on my MacBook, including ones that allow me to browse and modify files to my heart's content. I can even install Windows if I want to for gaming or more business-oriented applications. But personally, the MacBook Pro is much more of the right form factor. I have bad eyesight from birth, such that I'm barely above legally blind. I can read and see things just fine, but I have to get 8x (or something like that) closer than most people. When most people enjoy their laptop computer or iPad sitting on their lap on the couch, I cannot enjoy that. If I am forced to use it in that position, I either wear out my arms holding it up to eye level or destroy my back scrunching by body together to get my face down to the screen. Not at all comfortable or ergonomic. For me, the optimal working and even media consumption pose is seated on my ball at my desk with the laptop elevated on a stand at eye level. I even sit there to watch TV, although I might watch TV on a couch if I had a really big TV. If I anticipate wanting more than my iPhone on the go, I will carry my backpack with my laptop and a more portable stand. On the off chance that I was on a flight or longer bus trip on my own, it would be kinda cool to watch videos on the iPad's bigger screen, but I do neither of those enough to warrant such an expensive purchase. To sum up, I think the iPad is truly revolutionary and may be the future of computing. Maybe I'm being a bit slow to catch on to these trends, but I don't currently see the iPad as a viable option in my experience. I should maybe try one more thing with my iPhone 4, though: there's some settings that can be changed to make the iPhone/iPad usable for blind people. Maybe one of those days I'll try to turn some of those things on and see if that helps me at all. What To Do With Thanksgiving? Penny: So, what are you guys doing? Leonard: We’re watching Goonies, Gremlins and Young Sherlock Holmes. They were all written by Chris Columbus. Penny: Okay. What do you watch on Thanksgiving? - The Big Bang Theory, Season 3 Episode 4, "The Pirate Solution"
Every year, to celebrate Thanksgiving, my parents have had the whole family and a bunch of relatives and friends over for socializing, turkey, and stuff(ing). It's always great to see family, play cards with my grandparents, share a meal and give thanks. However, this coming Thanksgiving weekend my parents will be out of town, so I'm currently without a plan this Thanksgiving. What I can't decide is if I want to do something for Thanksgiving and, if so, what I want to do. When I say that I would "do nothing" for Thanksgiving, that would be that I'm doing nothing socially. I like long weekends such as this because I can spend hours and hours on my personal hobbies such as inReview.net. These websites are my way of playing with new technologies and my hobbies, but I struggle with doing them day-to-day because I find it works better if I have open-ended time of at least a couple hours to work hard on it, otherwise you spend an hour or two getting up to speed and figuring out what needs work and then you're done. Also, I get a little tired of doing web architecture/programming after 8 hours of doing it for work and so it's hard to spend my weeknights doing it. Spending Thanksgiving working on programming stuff may be a bit anti-social, but it's just this year and at least it's semi-productive. Since friends have found out that I have no plans for Thanksgiving and a number of them have invited me to their family celebration. However, I'm not sure I'll be that comfortable with that either. I've always gone to my family's celebration, and although I do know a number of these families a bunch, it seems like it could be pretty awkward to be the non-family member at a family tradition. I'm probably over-thinking this, but I guess I'm not too sure if I'm that comfortable with it. The other problem with attending Thanksgiving celebrations is that I think it's going to be boring. One of my friends invited me to his family's event, but after talking for a bit he said that the main event is drinking beer and watching football most of the day. Although I enjoy some good beer and the engaging commercials that play during football (and not during the shows I like), I get REALLY BORED watching football in no time flat. Although a bit of football is watched at my parents' house on Thanksgiving, I spend most of the time playing cards or chatting with aunts, uncles and cousins upstairs while the TV is on downstairs. So I'm not even sure if I want to go to Thanksgiving. So what do you think? Should I go find some turkey at a friend's house? Just keep working on the hobbies and just make myself a nice dinner? Am I anti-social? Am I not crazy? Am I asking too many questions? One of the artists I enjoy supporting is novelist (and entertainment news writer) Robin Parrish. I'd talked about his books in the past. And right now, his first book, Relentless, is available for free in the Amazon Kindle Store. Although his later work is better, it's a great beginning, and did I mention it's FREE? You can read Kindle E-Books on an Amazon Kindle as well as iPhones, iPod Touches, iPads, your Mac or PC, or various other smart phones. So get some free reading in! As usual, every fall Apple debuts a new line of iPods to wow the kids and parents into getting new iPods. And, of course, this year was no exception. On Wednesday, September 1st, Steve Jobs and many from the Apple crew showed the press their latest products at the Yerba Buena Center for the Arts in downtown San Francisco, CA. And as expected, the iPods were updated with cooler, newer features and a couple other new products were announced as well. One thing that was a bit more off the normal was that, the night before the event, Apple announced that they would be live streaming the video of the event to people around the world. At first, I immediately declared Apple crazy for endeavoring to do this because they stopped live streaming these types of events years ago because they couldn't handle the demand for millions of people trying to view the stream at the same time. However, before the event started, I found out that Apple had cleverly limited the persons who could view the live stream to Mac owners with the latest version of Mac OS X and iPhones and iPads. There are still millions upon millions who could watch this if they wanted, but it's definitely much less people than anyone who has a computer and may want to watch it. For example, I was at work where I use a PC so I could only stream the video over my iPhone. In the end, the streaming did work surprisingly well and did pretty well of keeping up even as I walked from WiFi to 3G and back during my lunch break. (It wasn't perfect, though; a couple times I had to restart the stream or the bandwidth cut so low that it went to audio-only.) It was still a pretty impressive demo of what Apple can do with QuickTime and some really fast, well-equipped servers and it was nice to see the actual video live instead of just reading a bunch of blogs that were posting text and images live. After a couple bits about the sales numbers, some beautiful new Apple Stores and a number of minor updates to iPhone and iPad software, Steve Jobs got down to announcing the latest new iPod products. First up was the iPod shuffle. The last iPod shuffle had no buttons on the device and only a couple controls on the headphones. The new iPod shuffle has the basic play/pause, next/previous and volume buttons in a familiar circular format on one side and a clip much like an earlier iPod shuffle, but it also features the audio-based controls of the last shuffle as well. It's a bit smaller than the earlier shuffles with the control buttons and has more storage and starts at only $49. This is the basic low-end product with a great basic feature set. This time around, the iPod nano is not much bigger than the iPod shuffle but it forfeits some of the features of the previous iPod nanos. Gone is the ability to play videos and the camera to take photos and videos with your iPod nano. The new nano sports a small form factor with a clip on the back and a 1.5-inch screen that is controlled by touch just like the iPhone, iPad, and iPod touch. Despite being small, this bright, detailed full-color display easily lets you browse your music and playlists. Also, the iPod nano includes other minor features, including volume buttons, a built-in FM tuner that can pause and rewind up to 15 minutes of the radio, Nike+ integration, Genius mixes and customizable menus. It doesn't have all the old features of the old iPod nano, but it has some great new features and is the smallest iPod nano yet. This device starts at $149 for 8GB of music and may be the hot new stocking stuffer this Christmas (at least that's what they say; I definitely don't get $150 gifts in my stocking and that's fine). The biggest, best device of the iPod touch, of course, and it got a nice update today as well. As Steve Jobs said, the iPod touch is like an iPhone without the phone part or a contract to pay a phone company a bunch of money. And thus, the new iPod touch includes the majority of the features of the iPhone 4. The beautiful Retina Display is there to display video in resolutions close to 720p. Also, the back camera will shoot photos and video up to 720p as well, although the camera doesn't seem to be as good of quality as the camera in the iPhone 4. And on the front side of the iPod touch there's also a low-resolution video camera so you can use the iPod touch for FaceTime, Apple's new video chat standard. Steve Jobs also remarked that the iPod touch sells more units than the Nintendo and Playstation portable devices combined and touted the touch as a big gaming platform. (In that vein, Apple will be releasing next week an app to iPhone and iPod touch called "GameCenter" that promotes playing multiplayer online games with your friends and manages game points and achievements as well.) And, of course, it runs the majority of the thousands of apps made for the iPhone, which makes it a powerful computer in the palm of your hand. The iPod touch is easily better than ever and starts at $229 for 8 GB and goes up to $399 for 64 GB. There is one more iPod that was not mentioned at all in the presentation: the iPod classic. This old-style iPod has all the look and basic audio and video playback functions of the iPods of yesteryear and a 160 GB hard drive to allow the music collectors such as myself the ability to take their whole library on the go. I do look forward to the day when I can replace the iPod classic with a 128 GB iPod touch or iPhone, but until then, this works great for bringing all my media on the go and will continue to be sold for the foreseeable future to fill that purpose. The other major announcement was the announcement of the release of iTunes 10. The tenth version of the long-running free music and media software features a slightly new look that some say make it look more friendly to touch-based computing and may point to the future of Macs including some touch-based screens but most just say it looks unlike anything else on the Mac or PC and therefore just looks out of place. (The icon was also changed and just looks generic and cartoon-ish.) The only other feature is a new social network centered around music and music purchasing called "Ping". Basically, it adds a bit of Facebook to the iTunes Music Store, as users can create a profile and feature music they like to friends. Their friends or followers can view a feed of iTunes music purchases as well as items in the store they've marked as "Liked". Friends can post comments on the posts and, of course, it's easy to buy the music featured in Ping since the entire social network is inside the store itself. With this and other features, Ping is a social network with a small set of features but will most likely become rather big rather quickly due to the fact that it's built into the iTunes music player software used by 160 million people around the world. For example, in just about 24 hours since the Ping service was widely available, 121,000+ Ping users are now following Lady GaGa's posts and activity on the service. Actually, Lady GaGa brings me to the current major shortcomings of Ping that need to be overcome ASAP. Katy Perry, U2, Muse and a couple dozen other bands from major labels join GaGa as the "artists" on Ping and they can post photos and videos from tours. However, it seems no other artists or bands know how they can create an artist profile. Due to this, initial users of the system are finding it very limited because they really cannot find artists they like to follow on Ping. And as far as I can find, there is no documentation that explains how artists or labels can get artist pages that they can post to. With a system like Ping that is being adopted so quickly, artists immediately need a way to get involved and if Apple does not fix this shortly, people are going to be quickly bored with Ping. I expect this should be fixed in the next couple days because Apple usually fixes a problem of this caliber pretty quickly. That is, unless they are just doing Ping to cater to the major labels and they decide to only give the majors access -- that would be terrible. The final announcement from the Apple event was the 2nd generation of the Apple TV. The new Apple TV is a rounded black box that is not much bigger than a hockey puck and brings all kinds of Internet and Apple-related content to your HDTV. With the new Apple TV (or your computer), you can now rent some TV shows in HD for as little as 99 cents per episode (currently only if the show runs on ABC or FOX; hopefully more networks later). The Apple TV includes no hard drive storage and instead relies on streaming data from the Internet or another computer on the home network. In fact, the announced an expansion to the AirTunes feature that lets you stream audio to another set of speakers in the house such that it's now called AirPlay and in November you will be able to stream videos or audio from your iPad or iPhone to the Apple TV display as well. And, like every other Internet-connected device that plugs into your TV today, it connects to Netflix to stream video from there as well (if you are a Netflix subscriber). One minor difference is that Apple got this version of Netflix to run with an Apple TV-style look to it and Steve Jobs calls it "the best interface for Netflix." Oh yeah, and the Apple TV is now priced at only $99, which may be low enough of a price for people to want to get one this Christmas. Overall, this Apple event had some big announcements, but none of them really blew me away or surprised me that much. None of these am I planning on buying anytime in the future, at least not for myself. On the other hand, the September event is never really the place for the ground-breaking new products; it's just to show off the mass-market electronics for everyone, not the next big thing in computing and media. As long as Apple's still going, though, we can expect more ground-breaking new products in the New Year.